Roadtrip-'62 ™ recently took looks at both US-8 and US-10. Today we travel down parts of US-12, which currently runs from Detroit, Michigan to Aberdeen, Washington, 2,491 miles today. In 1962, it was not only much shorter on its western end, but the Michigan portion was on an entirely different alignment! Prior to 1939, US-12’s west end was at the Northeast entrance of Yellowstone National Park (now US-212). 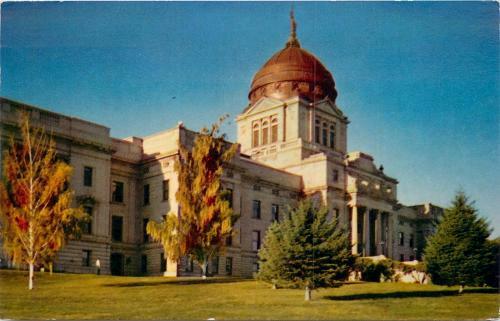 It was relocated to Missoula, Montana in 1959, and extended to Lewiston, Idaho in 1962. This is the end we would have seen late in the year, as it was not extended to Abderdeen until 1967. The 1962 extension and part of the road in eastern Washington more-or-less follows the route of the Lewis and Clark Expedition and is marked as part of the Lewis and Clark National Historic Trail, as are some other parts of the highway. 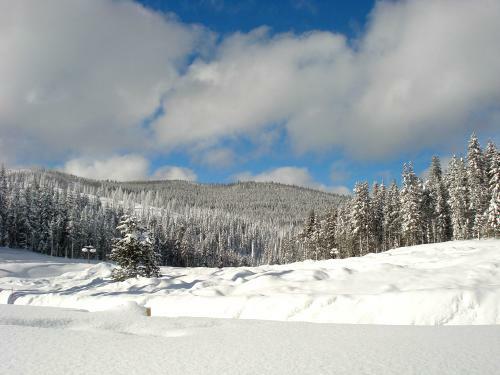 It was one of the last sections of US-numbered highways to be constructed and there was no road across much of this mountainous section of Idaho through Lolo Pass before that. Today the Idaho portion is said to be a great motorcycle road, for its twists and turns. The Michigan end was also relocated in 1962, after the I-94 freeway was completed across the state. To avoid double numbering, US-12 was moved to the former route of US-112, which disappeared. Throughout Illinois, Wisconsin, and Minnesota, US-12 either runs together with or criss-crosses several other routes. Highway US-14 begins in Chicago and follows US-12 northwest out of town, just a few miles away, to Madison, Wisconsin. There, US-12 meets route US-18, which began in Milwaukee, Wisconsin along with US-16. Of course, US-12 meets US-16 at the Wisconsin Dells and they travel together about 50 miles to Tomah, Wisconsin. And if that weren’t enough duplication, US-12 crosses US-10 at Fairchild, Wisconsin and again at St. Paul Minnesota. To complete the tangle of highways, US-8 ends at St. Paul, whew! After that, these routes straighten out to head west across the prairie, spaced form north to south by increasing route number, just the way the US-route system was designed. Wisconsin also has treats for lovers of modern architecture, because there are several buildings designed by Frank Lloyd Wright and his students. For much of his life, his home and studio was at Taliesin in Spring Green, Wisconsin. Highway US-12 heads through the capitol of Wisconsin at Madison, which has some of his buildings. The easiest one to visit, and one that could also have been visited in 1962, is the First Unitarian Meeting House. This church is one of two that he designed for Unitarian Universalist organizations. The building was completed in 1951 and is constructed of limestone and oak with a soaring, distinctive copper roof. Tours are available and I highly recommend taking one, as I did last summer. Tours are also available at the Monona Terrace, a convention center originally designed by Wright and completed in 1997 by others at Taliesin Associated Architects after Wright’s death. Another Wright designed building in Madison is the Walter and Mary Ellen Rudin House. This was constructed inn collaboration with builder Marshall Erdman, Wright’s colleague on the First Unitarian Meeting House. It is one of eleven similar prefab homes built as part of his Usonian designs, intended to make innovative design more affordable to the middle class. It was finished in 1959 and is not open to the public. Wright’s older Robert M. Lamp House, one of his earliest Prairie School designs, is also in Madison. It is quite different from the later designs and unfortunately suffers from poor maintenance over the years since its completion in 1903. It is also not open to the public, though some local proponents would like to see it turned into a museum. A final private home in the area is the Eugene A. Gilmore House, also known as the Airplane House. It was built in 1908 and expanded twenty years later. The home is in the Prairie style, with strong horizontal lines and a cantilevered porch roof. Wisconsin is also famous for the Wisconsin Dells, at the city of the same name. The Dells are named for the gorge on the Wisconsin River, from the French word for narrow, dalles. This 5-mile long gorge has numerous side canyons and cliffs over 100 feet high. These sandstone formations were created when an ice dam that impounded a great glacial lake during the last Ice Age finally melted, creating a catastrophic flood and carving the rock. The rock formations have made Wisconsin Dells a recreation destination since the 1850s, making them one of the oldest resort areas in the state. Like many other resort areas, they boomed in the 1950s, as Americans took their big new cars on the road. The iconic Dells Army Ducks were brought to town in 1946 and were actual surplus Army amphibious vehicles. Modern versions are still giving fun and splashy rides through the Lower Dells and nearby woods and canyons, as an alternative to the boat ride down the river and back that I took last year. Tommy Bartlett’s water skiing show also came in the 1950s and added a man-made attraction to the natural one. After passing through the metropolis of Minneapolis-St. Paul, Minnesota, US-12 heads west through the farm country of the Great Plains. We’ll investigate Minneapolis and St. Paul some other time: there are plenty of US-numbered routes passing through. Willmar, Minnesota is rather typical of small farming towns we pass through on US-12. It has a small history museum, operated by the Kandiyohi County Historical Society. The society was incorporated in 1940 under its current name, but had existed since 1897 under other names. They currently have six buildings including the main museum and research library, District #18 Schoolhouse, Great Northern Railroad steam engine #2523, Sperry House, Grandpa’s Shed, and an agriculture building. In 1962 we would only have visited the main museum, as the locomotive and other buildings were moved here during the late 1960s through 1971. The city also has one major industry, the Jennie-O turkey processing plant. The Jennie-O brand of turkey products was founded in Willmar by Earl B. Olson in 1940, when he began raising turkeys. It is now one of the two largest turkey processing companies in the United States. It was family owned until 1986, when it was sold to Hormel Foods. And, like many small towns, it has one famous son. Comic book artist Curt Swan, most famous for drawing the Superman line of comics during the 1950s through 1986, lived here at some point. 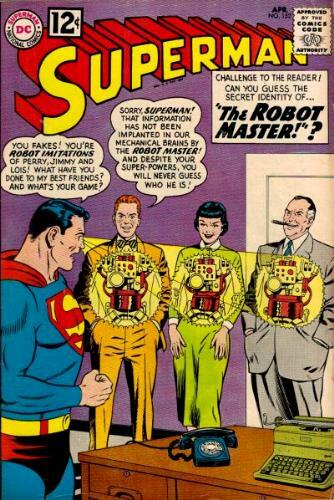 His was among my favorite comic art when growing up around 1962. Even at just 9 years old, I loved his simple lines and how he could change the expression of a character with just a squiggle or two. One of the same things I loved about the Peanuts comic strip. Like me, you may think of petrified wood as something you would only see in the American Southwest. But we can also find it at the dry edge of the high prairie. Petrified wood is all over the rocky butte country of western North Dakota, and Lemmon is in South Dakota right at the border with North Dakota. Petrified wood was formed when ancient trees were trapped underground or underwater without any oxygen, such as under the shallow seas that once covered this area. Minerals were deposited into the dead tree’s cells, and over time the process turned the wood to stone, preserving the cellular structure. Lemmon’s Petrified Wood Park occupies an entire city block right in the heart of downtown. The park was built between 1930-1932 by “thirty to forty otherwise unemployed men” during the Great Depression. They were supervised by Ole S. Quammen, an amatuer geologist, who also supervised collection of the rocks and fossils from local sources. They built a castle, a wishing well, a waterfall, the Lemmon Pioneer Museum, and hundreds of pile sculptures all made of petrified wood on land owned by Quammen. Upon his death in 1954, the park was donated to the city. 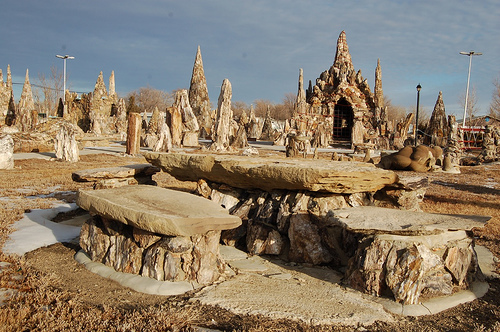 Among Petrified Wood Park’s most unusual sculptures are a hundred conical sculptures up to 20 feet tall. There are also stone trees, which are decorated with Christmas lights for an annual holiday "Fantasyland" display. In addition to the Castle building, which includes dinosaur bones cemented into the interior walls, the park includes the Petrified Wood Park Museum in an imposing petrified wood building with spires. We’ll next stop in Helena, Montana, the state capital. It’s only 20 miles from the Continental Divide, where US-12 begins heading down to the Pacific Ocean. Helena is situated in the mountains and was founded in 1864 as a mining town, when prospectors discovered an extensive placer gold deposit. A placer deposit is an accumulation of heavier minerals formed by settling out of lighter sediments, usually by water. Placer mining was the main technique used in many early gold rushes, and Helena was no exception. Most of the production occurred before 1868 but the mining continued for about twenty years, ending after over $3.6 billion of gold was extracted in the city limits. Helena became one of the wealthiest cities in the United States and the concentration of wealth contributed to the city's prominent, elaborate Victorian architecture still visible today. Once the gold ran out, Helena could easily have become a ghost town. However, it had become the territorial banking center, and a distribution center for goods to and from other mining areas. These activities led directly to it becoming the territorial capital in 1875. A visit to the state capitol building is a good way to spend the afternoon. The main building was completed in 1902, with two wings following in 1912. It sits on 10 acres of spacious lawns and other state buildings, and is constructed of sandstone and granite. A statue of Liberty sits atop the copper dome and artist Charles M. Russell's painting of Lewis and Clark meeting the Indians at Ross' Hole adorns the interior. Well, I don’t want to cram too much into one post, so I guess it’s time to stop here in Montana. This is a long way from the beginning of US-12, both in mileage and spirit. We’re in a completely different countryside than the big cities the route passed through early on the trip: Detroit, Chicago, and Minneapolis. But US-12 has it all; big cities, small farm towns, and wilderness, the Great Lakes, The Great Plains, and The Rocky Mountains. As I mentioned at the beginning, the next leg of the route was newly extended to Lewiston, Idaho in 1962. So I’ll head out across the wilderness of northern Idaho, through the the Nez Perce-Clearwater National Forests, and see you some other time on Roadtrip-'62 ™ when I come through Lewiston from another direction.